‘Beer of the Month’ is a regular series where our editors sample a unique craft beer. 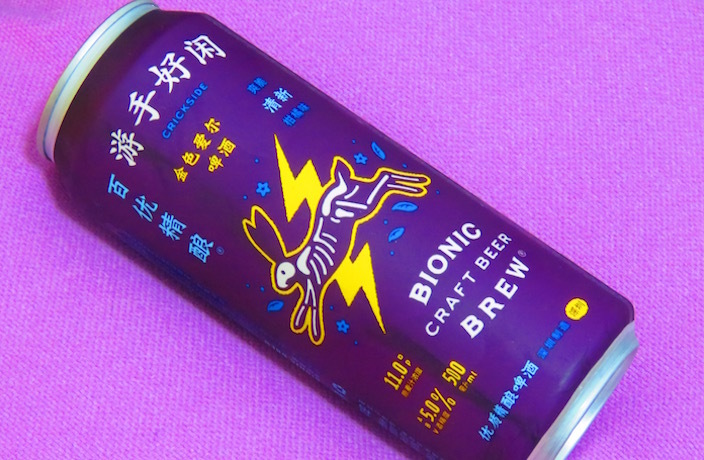 This month, our Shenzhen editorial team sampled Bionic Brew's Crickside! When chatting about South China’s growing craft beer scene, you are likely to hear mention of Bionic Brew. The crew’s name, bar and stamp are somewhat iconic in Shenzhen and their Baishizhou tap house is known throughout the city as one of the better places to grab a carefully brewed sud. While we’ve tried Crickside in the past, it’s usually been accompanied by the taste-altering salty snacks that are available at the numerous barbecues in the vicinity of the Bionic Brew bar. For this story, we brought a can home to enjoy on its own, in an effort to accurately unpackage all its facets. We purchased a 500-mililiter can of Crickside from Bionic Brew’s tap house for RMB40. The tall can, which is textured in a manner uncommon to most aluminum beer cans, is adorned in both Chinese and English characters, although the ingredients are only listed in Chinese, something we were a tad disappointed with. Featuring Bionic Brew’s signature ‘electrified bunny’ logo, the can also specifies IBU (International Bittering Units), Plato rating and ABV (alcohol by volume) up front. The beer itself is a murky brown slash dark amber and resembles the color of an English bitter. With an IBU rating of 22, however, Crickside is lower on the scale than a standard English bitter and more in the range of a kolsch. According to the brewery’s website, Crickside is in fact a kolsch. In other words, it is fermented with pale yeast and finished with a lagering process, a technique that is said to result in a crisp and clean finish. Strangely, however, the coloration of the drink is darker than your standard kolsch. The brew is bubbly and voluminous and almost instinctively sits at the front of the drinker’s mouth for a few seconds after each sip. In terms of taste, Crickside offers a sharp burst of flavor that hovers around the mid-to-back part of the tongue and gets lodged on the roof of your mouth. While it is hard to put our finger on the exact taste, the sharpness and dryness of the brew belies something quite citrusy. Crickside is a love-it-or-hate-it concoction. If you like bitter pale ales, this is for you, if you don’t, have your mouthwash at the ready because the taste lingers for quite a while. When hitting it hard, we prefer something with a little less bite, but if you are going to the bar for just a few drinks and want to sip on something well-crafted and big on taste, Crickside is a solid choice. You can order 12 cans of Crickside for RMB280 on Bionic Brew’s WeChat store by searching ‘百优精酿BionicBrew’. Click here to read more ‘Beer of the Month’ columns. If you’re a fan of slightly-hopped beers, sessionable suds, then Master Gao’s Baby Jasmine Tea Lager is well worth a sip! We're giving away two tickets to the craft beer NYE party. Boxing Cat is throwing the 8th Annual Shanghai Craft Beer Festival all weekend long! Want to attend Shanghai Love's Charity Beer Festival for free? The age old pub debate.